Summer Reading Programs at Mendon Library show Libraries Really Do Rock! Home Summer Reading Programs at Mendon Library show Libraries Really Do Rock! Thanks to a lot of community support, namely M&T Bank and the Friends of the Mendon Public Library, babies, children, teens, and adults have had a lot to celebrate at the Mendon Public Library this summer. The Summer Reading Program, “Libraries Rock”, is really rocking. Lots of fun is being had at the Mendon Public Library. So far, we’ve had programs featuring arts and crafts, nutrition, science, storytelling, safety lessons, movies, LEGO building, and, we’ve had lots of patrons coming in to get books to read poolside or in hammocks! Coming up, the library will be offering more of the above AND programs about the environment, music and more. Participation in all activities and the reading incentive programs are free. Some events do require reservations, and some events are targeted toward specific audiences. To learn more, stop by the Library to pick up a brochure or look online at mendonlibrary.org/Summer Reading Tab (right sidebar). Let’s “Rock” and enjoy a summer full of reading! 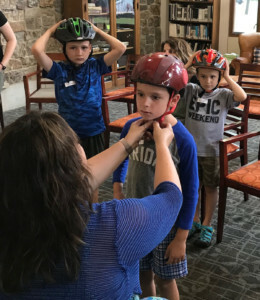 Mendon Public Library continues to be able to offer the Summer Reading Program to the community thanks to a generous grant from M&T Bank and support from the Friends of the Mendon Public Library.